The extent of my painting education was a half-semester of independent study in high school. I learned the dangers of using turpentine brush-cleaner in a poorly ventilated room, the frustration of using watercolors on thin, cheap paper, and the incredible length of time it takes for oil paint to fully dry. A couple years later, I gave up painting for the boundless rewards of cartooning. I use a wax medium with my oil paints; it gives the finished work a rich buttery look that resembles melted crayons, but the drying time is about three weeks. How wonderful that you were able to find your passion. It shows. Feanne: Wow, that color name survey is awesome. Greasemonkey: I imagine it would be hard to resist the temptation to change things in the three weeks of drying time! I might try painting with actual melted crayons instead. I'm glad I found your site! Your comic strips are fun! 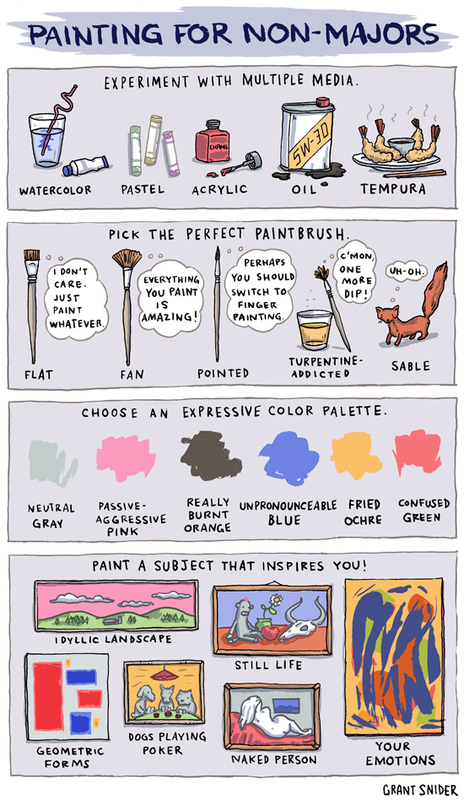 I'm also not a painter, so I'll be using this as a literal guide :) So smart, so fun. Well done! Love your cartooning wit! HAHAHA! Really Burnt Orange! Fantastic comic. Even though I haven't formally entered art school, I'm glad to have been a part of an office fitout perth team. I found my passion in decorating the workplace by balancing work and play. I just had a crazy idea of painting a building with "my emotions." I just need little customized hoist that can carry five people. Maybe you could use your painting skills to help me out? I haven't done a crazy thing for a month now. Your painting skills will be perfect for designing our fences. I've been wanting to add some life to it, so whenever anyone crosses by, they would see that "dogs playing poker" painting. That would make anyone smile. Great ideas and painting skills you have!